:Sadly, many who are called to be great prayer warriors never discover their calling because they are too busy eyeing with envy the fruit of other people's prayers. The fact is that each of us is on a mission from God, and we have been equipped by the Lord to carry out our assignments using the incredible power of prayer. Whether you are a "list" pray-er, a warfare pray-er, a personal intercessor--any of at least a dozen prayer specialties --every Christian has a piece of God's heart to pray and His power to carry to a lost and dying world. This book will help you discover how you can be most effective in praying for your family, your friends and neighbors, your church, your city, and your nation. TOMMIE FEMRITE, founding apostle of GateKeepers International and Apostolic Intercessors Network, is an ordained minister with an earned doctorate of practical ministry from Wagner Leadership Institute. A highly respected teacher, she links the wisdom of God with humor and prophetic accuracy. She is an active participant in the International Coalition of Apostles and the Eagles' Vision Apostolic Team. She and her husband, Ralph, live in Colorado Springs, Colorado. 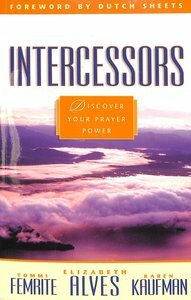 Alves is founder of Intercessors International. "KAREN KAUFMAN " is a freelance writer and editor who als "KAREN KAUFMAN " is a freelance writer and editor who als "KAREN KAUFMAN " is a freelance writer and editor who also teaches and counsels God's people to help them find inner o teaches and counsels God's people to help them find inner o teaches and counsels God's people to help them find inner healing. " healing. " healing. "